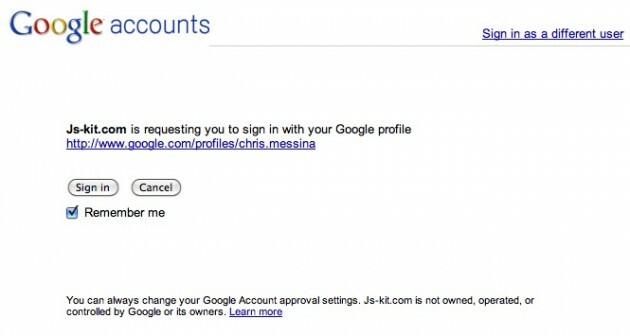 What this means is that you can sign into any site that accepts OpenID simply by using your Google Profile domain. Luckily, a few months ago Google started allowing these profiles to have vanity URLs, like /mgsiegler, instead of the previous /32090329039402903. Chris Messina, a huge proponent of the open web movement, has just sent out a picture of what signing in with OpenID via your Google Profile looks like (below). Despite its good intentions, OpenID has yet to take off in mainstream usage. The problem, it seems, is largely about presentation. Most people have no idea which of their various accounts can be used as OpenIDs, or really even what OpenID is. 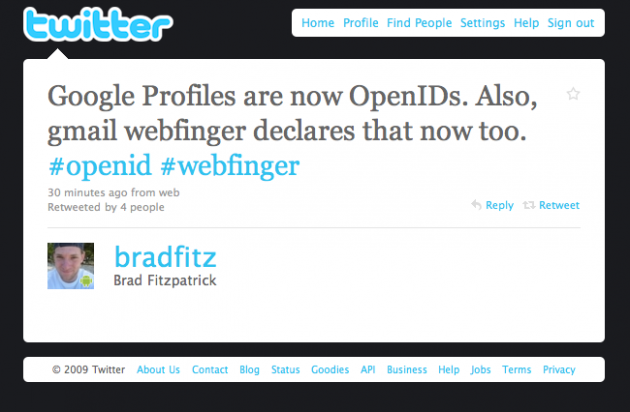 Google backing it a bit more with these profiles obviously helps, but will it take OpenID mainstream? Probably not. More interesting may be the second part of Fitzpatrick’s tweet. “Also, gmail webfinger declares that now too.” It’s not entirely clear what he means by that, but it would seem to suggest that we’re getting closer to being able to use our Gmail addresses as a web ID. WebFinger is a protocol being worked on by Fitzpatrick to allow you to attach information to your email address (in this case, you Gmail address), so it can be used as a solid means of identification. Update: Kevin Marks (former Googler, now with BT) has pointed me to webfinger.org an example site built by Blaine Cook (formerly of Twitter). The site allows you to easily set up your Gmail account with Webfinger right now. As you can see in the example below from Cook’s account, many of the social networks Cook is a part of are pinned to his email address.